Such small flaws and minor imperfections in your smile can make a big impact on your self-confidence. It can lower your self-esteem as you compare your teeth to your peers’ teeth. You no longer need to worry or find fault with your smile. At Echeverri Dental Center, we can help you achieve your dream smile. Our loving team will work with you attain your ideal smile. We will help you set realistic and reachable goals, so you can come closer to having your perfect pearly whites. Teeth Whitening: We offer two different professional whitening systems. For in-office teeth whitening, we use Zoom. Zoom is a powerful whitening system that can brighten your teeth several shades lighter in a single appointment! We also use Opalescence, a take-home whitening system, if you would prefer to whiten your teeth in the comfort of your own home. With either option, you can have a beautiful, glittering grin! Dental Veneers: Dental veneers are best for fixing minor flaws, like chips or cracks in your teeth. They can also be used to whiten a stubborn tooth that resists teeth whitening. Dental veneers are crafted from finely shaved pieces of porcelain that are custom-designed to match your smile. Once the veneers are made, they are bonded directly to your tooth. They act as a shield in fortifying your enamel, while simultaneously improving your smile! Dental Crowns: Dental crowns, nicknamed “tooth caps,” are designed to fit over an imperfect tooth. Dental crowns can mask imperfections in your smile and also provide protection to the damaged tooth underneath. They are typically made of porcelain. At Echeverri Dental Center, we will make sure your dental crown blends in seamlessly with the rest of your smile. 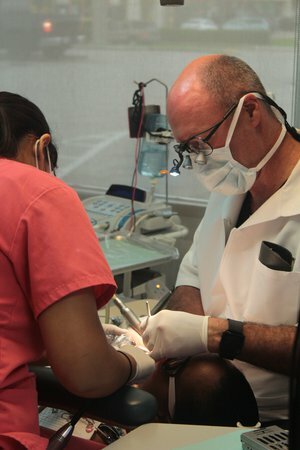 Dental Implants: Dental implants are considered the best way to replace missing teeth because they act like real teeth. They feature a synthetic tooth root and artificial crown to mimic the function and appearance of a real tooth. Dental implants will promote jaw strength, support your other teeth, and greatly enhance your smile. At Echeverri Dental Center, we care about you and want to make sure you feel happy with your smile. Our skilled staff will work hard to make sure you’re 100% satisfied with your new smile. We offer services in both English and Spanish at our Houston, Texas dentist office. We would be happy to assist you in any way possible. Contact us to learn more about cosmetic dentistry. Call us today to schedule an appointment to start working toward your dream smile!